According to recent reports, several school districts across Illinois were surprised to learn that their state funding had been slashed for early childhood education (ECE), resulting in sudden cutbacks to services. This is a reckless way to fund public education. These types of haphazard moves are disruptive for children, parents and educational staffs. Furthermore, they are counterproductive. It is well-established that ECE helps children, especially those who are at-risk, be better prepared emotionally and in foundational reading and math for K-12 education. Less obvious is how ECE benefits society as a whole, particularly from a financial perspective. The Perry Preschool Study followed two groups—one that received ECE services and another that did not—from ages 3 and 4 through 40. 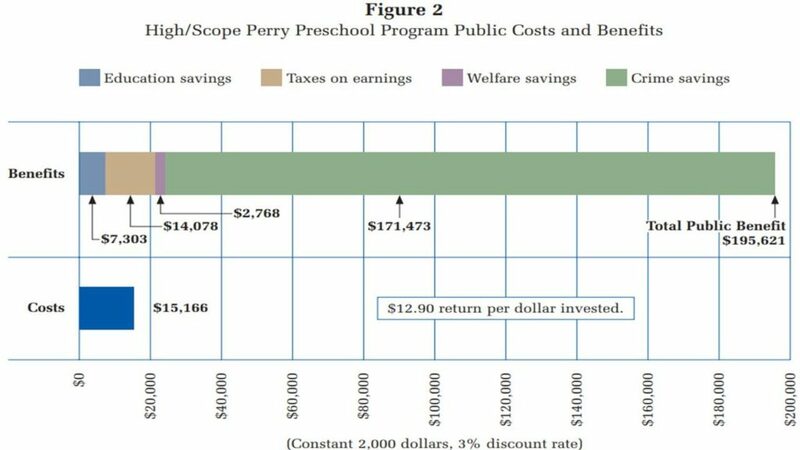 The study found that the adults who had received ECE services “had higher earnings, committed fewer crimes; were more likely to hold a job, and were more likely to have graduated from high school than adults who did not have a preschool education.” As the accompanying graphs indicate, the Perry Preschool Study calculated that those outcomes translate to public savings of $12.90 per $1 invested in ECE. The message is clear: ECE should be an integral part of public education in Illinois. Not only does it make fiscal sense, but it is also the right thing to do for our children.